Kitchen lovers in the culinary creativity of housewives reminds a magical laboratory, where in an infinite number of jars, containers and bottles are stored all sorts of ingredients for cooking. Feeling themselves the keepers of the home and the wizards of cooking, many housewives skillfully create their flavoring “chips”, prepare original refills from sunflower oil and spices, enjoying the creativity. Sprigs of rosemary, parsley, cilantro, dill, basil, garlic, red, black pepper, orange slices, lemon, slices of dried fruits and dried mushrooms look beautiful in transparent bottles with oil, shimmer in the light and personify the magic of the birth of new flavors, when spices, herbs , citrus fruits saturate their fragrance with sunflower oil. The refueling received in this way will add a fresh aroma of summer to the familiar dishes and baking, make the taste more pronounced, spicy, memorable. 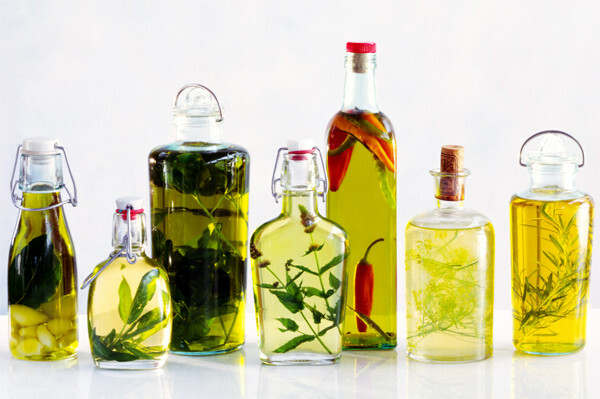 To make a fragrant oil, choose a transparent container with a wide neck: through it, you can easily put spices and herbs, spices, citrus, dried fruit into the dishes. A great option would be a glass jar or a bottle with a screw cap. At the end of the infusion, the oil can be poured into a beautiful decanter with a tight-fitting cap-stopper, put on a shelf, out of reach of direct sunlight. What ingredients to choose for infusion? Products for the preparation of fragrant oil can be very different: fragrant herbs, vegetables, spices, citrus fruits, dried fruits, dried mushrooms. They can be used not only individually but also in an original combination, based on your own taste and the list of dishes that you like and plan to cook. To insist the oil in containers with herbs, spices and spices is interesting and fascinating: as a result you will get an amazingly useful and fragrant product. The oil must be well heated to a temperature of 80-90 degrees, without bringing it to a boil. Before using, the herbs should be thoroughly washed and dried, and only then they must be put in butter, pre-cut into pieces or ripped with hands. Insist product with basil, parsley, dill, cilantro and other herbs need 2-3 weeks. At the end of this time, the product must be filtered and placed in a cool place, away from sunlight. Black pepper, badon, cardamom, cloves, coriander and other spices (according to your taste) should be grinded in a coffee grinder. The resulting mixture is placed in a glass container and filled with vegetable oil at room temperature. Citrus, dried mushrooms, dried fruits should be carefully washed, dried and cut into small pieces. The oil must be preheated, but not brought to a boil, and then poured into a warm mixture of crushed, prepared ingredients. Insist a fragrant oil with citrus, dried fruits and dried mushrooms 1 month, and after this time the product must be filtered. To make the result of the aromatic oil filling refresh you and inspire you to new culinary experiments, choose refined oil from the assortment of the domestic company “Kaissa Oil“, which unites several of the best oil refineries in Ukraine.